Average Weight	: 13 - 22 lbs. Westie Rescue Of The Mid-Atlantic States Inc. This darling breed is well known and typically called a "Westie". hese short-legged Scotland terriers are now known as the Scottish, Skye, Cairn, Dandie Dinmont, and West Highland White Terriers--and all were bred as small game hunters. Not raised as pets alone, each breed of terrier was a working dog and had a specific purpose-keeping vermin in control for the Scotland villages, coalmines, mills, farms, and homes. Zestful diggers and hunters as they were, flower gardens and vegetable patches today presents a challenge to these little hunters. Originally these dogs had colors which ranged from red to cream, and cream to white. Because one of his red dogs were killed emerging from the hunt, Colonel Edward Donald Malcom, of Poltlloch, Argyllshire, Scotland, bred his hunting lines down to white because of that situation. This brought on the Poltlloch White Terrier, or eventually the West Highland White Terrier. Up until that time, all white terriers were killed immediately at birth. The Westie should be trained to be accustomed to any grooming features as a young puppy before grooming ever begins, beginning with two to three minutes a day to begin with. Daily combings will make him accustomed to being touch all over, and the pleasure of having his coat brushed. The West Highland White Terrier needs firmness when this early training begins, but no roughness or loud voices should be part of the training methods. The next step is to begin the habit of grooming the little Westie about once a week to clip out of place hair and checking his ears, gradually increasing the time spent on the actual grooming. A two to three minute brush-out should begin to be done on a daily basis, laying the Westie puppy on the grooming table until the young dog begins to be anxious about the grooming. 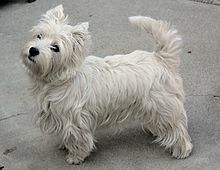 The decision whether to strip or groom the little Westie depends a lot on whether or not the dog will be shown or not. Simply put, it is a matter of personal preferences, as stripping makes the coat harder and coarser, while clipping the coat makes it softer and wavy on some dogs. Most people clip a dog because it is easy and quick, and both methods give two entirely different looks to the breed. If the groomers or the owner is good at dog grooming, the standard look of the breed will be as good with a clipper as with stripping. If the decision to use clippers gives too soft of a look, changing the mind is still an option as once the hair is grown back slightly, hand stripping can be done then until it gets the real Westie look and feel, done naturally. Exercise for dogs should be the same as exercise for their owners-it is good for the mind, a good and healthy physical activity to keep the body in shape, and it relieves stress. Such things anymore as dog treadmills, doggy day cares, doggie gyms, playing at the park, or just simple walking-all of these are fun and healthy for the Westie and its owner. The Westie, as a high-energy dog, can develop pent-up energy when sitting around the apartment all day waiting for the family to come home. If the West Highland White Terrier does not get enough exercise to remove this energy, or at least spread it around a bit, then destructive behavior can occur. This behavior can occur in many forms-chewing, barking, digging, stubbornness, not minding, vomiting, stool issues, and depression. Intelligent as the West Highland White Terrier is, it is important to understand the whole concept of the Westie personality and essence of who they are. One article says it all, "The Westie is really a big dog inside a small dog's body." The dog has the personality that is spunky, intelligent, bold, independent, lots of self-esteem--and stubborn. These varied qualities of the little Westie terrier breed in mind, will help prepare a person for the beginning "fun of training a Westie." If a Westie is given too much at once, the breed will quickly develop the ability to acquire the upper hand, becoming bossy and aggressive to the point of becoming aggressive and snapping or biting. The assertive nature of the Westie, notwithstanding its intelligence, needs to be properly understood to avoid any behavior issues that could develop. But before any training begins, the thing to know before starting is whether it suffers any negative setbacks such as lack of companionship, lack of discipline, activity, or exercise. If none of these are available, then the Westie can become very destructive if left alone. Some commands are more important than others-at least to begin with. The West Highland should know the five basic commands plus some-come, heel, sit, down, and stay. Combining them to form a sit-stay and down-stay is also very beneficial for a dog such as the Westie with an overwhelming attraction to people combined with high energy. Stay firm yet positive, always ending every training session with a command the dog does know, even after spending an hour or so learning new ones.